Do you have a bucket list of places you want to visit before you pass away? If so, is Iceland on this list? If not, it should be! There are some places that are purely unique. They are unlike anywhere else in the world. They provide the most magical landscapes and some of the most unique activities to enjoy. Iceland falls into this category. With that being said, read on to discover the many reasons why everyone should visit Iceland at least once in their lifetime. The Icelandic Highlands – Let’s begin with one of the world’s most astonishing natural wonders, and this is the highlands. They cover most of the interior of Iceland. Often called the heart of Iceland, the highlands present an untouched and unique part of the country whereby you can travel for hours on end and you will not see anything apart from the rugged mountain road you are driving on. That’s right; no signs of human civialisation whatsoever. Where else can you visit and say this? In today’s crazy world, taking a step back and being in pure peace, serenity, beauty, and nature is something incredible to experience. The black beaches – Another reason why Iceland is a place you should consider for your next holiday is because of the black beaches. They may not be the most tropical beaches in the world but they are definitely some of the most extreme. The most famous of these beaches is Reynisfjara. This is a black pebble beach, which is situated close to Vik – the southernmost village in the country. It is a powerful place to say the least. Expect strong winds, huge rock formations, gigantic caves, and black basalt cliffs. The word dramatic seems like an understatement. Another beach that is worth a mention is Breidamerkursandur’s Diamond Beach. All year round, this beach is adorned with a strip of black sand. Look at some of the photographs online and they will blow your mind. Volcanoes – Another reason why you should visit Iceland at least once in your life is that of the volcanoes on the island. The volcano tours are fascinating. The Prihnukagigur magma chamber is widely deemed the most interesting natural phenomenon of its type. A tour here will involve delving into the cold centre of the dormant volcano. The fiery shades here tell the tales of unspeakable destruction and power. Visiting here can almost feel like an outer body experience! The wildlife – You simply cannot talk about Iceland without mentioning the wildlife. Iceland plays home to an incredible variety of Arctic animals; spirits of the air, sea, and land. This guide to Iceland’s enchanting wildlife is the best thing to read for some more information. From the Greenland Shark to the Icelandic Goat, you will find out everything you need to know regarding the wild animals that call Iceland their home. The glaciers – You were probably expecting the glaciers of Iceland to be on the list, and for good reason. It is of no surprise that Iceland is called the Land of Ice and Fire when you consider that there are so many volcanoes and glaciers scattered around the island. In fact, 11 per cent of the country is covered by glaciers, which is astonishing. Vatnajokull is the biggest glacier. It covers the greater part of the central and southern highlands. There are lots of different glacier tours you can enjoy while you are in Iceland, from helicopter rides and snowmobile tours to hiking excursions. Geothermal baths – In addition to the points that have already been mentioned, the geothermal baths in Iceland also make the country unique. 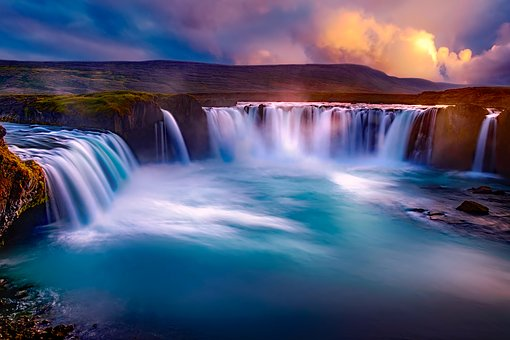 The most valuable natural resource in Iceland has to be the rich water supply. It is of an exceptional quality thanks to the glacier streams and unspoiled mountain. Moreover, the country has a steep history when it comes to creating power through geothermal energy. This also means that, all over the country, you can find natural pools. Landmannalaugar plays home to the most remarkable natural pools. The Northern Lights – You did not think we were going to talk about Iceland without mentioning The Northern Lights, did you? This is a natural light display in the Earth’s sky, which can typically be viewed in regions of a high-latitude. Iceland is one of the best places in the world to witness the Northern Lights. You can typically expect to see these from the months of September through to mid-April, presenting one of the most compelling reasons for visiting Iceland outside of the summer months. To increase your chances of seeing these lights, it is best to head out of town. Moving away from the disturbance of the city and electric lighting will help you to improve your chances of seeing this phenomenon. Of course, there are plenty of tours for the Northern Lights as well. As you can see, there are many different reasons why everyone should visit Iceland at least once in their lifetime. From the amazing highlands to the glaciers and the wildlife, there is something for everyone to enjoy. However, what truly makes Iceland a must-visit is the fact that there is nowhere else like it on the planet. You won’t find such dramatic landscapes and such a unique atmosphere anywhere else in the world. You have to see it to believe it! So, no matter how old you are or what you enjoy, make it your aim to visit Iceland at least once! Next Next post: How to make Instagram your ally in B2B marketing?